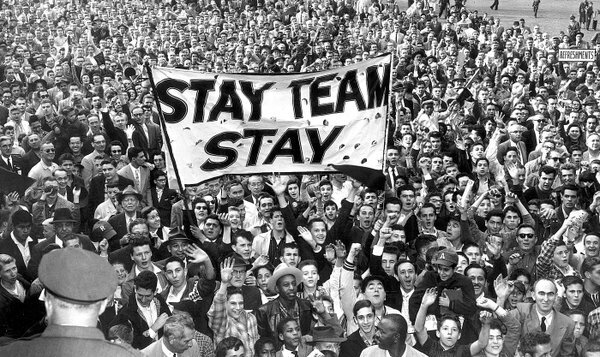 Sixty years ago today the Giants and Dodgers wrapped up their final seasons in New York. There are still some around who remember when the Giants called the Polo Grounds home and Brooklyn’s Dodgers toiled in Ebbets Field. For most, though, the two clubs are as much a part of California as the San Andreas Fault. In reality, the transition to San Francisco and Los Angeles, respectively, was anything but smooth. There were considerable machinations, particularly by Dodgers owner Walter O’Malley, in the year or so leading up to the move, along with no shortage of hardheadedness by New York City officials. And while the rivalry between the two clubs continued, almost none of the stars on either club enjoyed anywhere close to the same level of success once the teams relocated. The Dodgers’ Duke Snider, Gil Hodges, Pee Wee Reese, Carl Furillo, Don Newcombe and Carl Erskine were at the end of their careers and would never realize the same levels of accomplishment they had in Brooklyn. In addition, Jackie Robinson had retired after the 1956 season, Roy Campanella had been paralyzed in an auto accident in January 1958 and others such as Sandy Koufax hadn’t yet become stars. For the Giants, who by 1957 had a lineup with considerably fewer standouts than the Dodgers, Bobby Thomson, Hank Sauer and Johnny Antonelli were nearing the end of the line and future greats such as Willie McCovey, Juan Marichal and Orlando Cepeda had yet to make it to the big league club. The only star from either club whose fame transcended the shift from East Coast to the West Coast was Willie Mays, who would go on to play for 15 seasons in San Francisco. Today, it seems difficult to fathom major league baseball without operations on the West Coast. There are not only the Dodgers and Giants, but three other teams in California, along with a club in Seattle. Yes, expansion west was inevitable, but did it have to cost the fans of baseball’s biggest market two its most storied franchises? 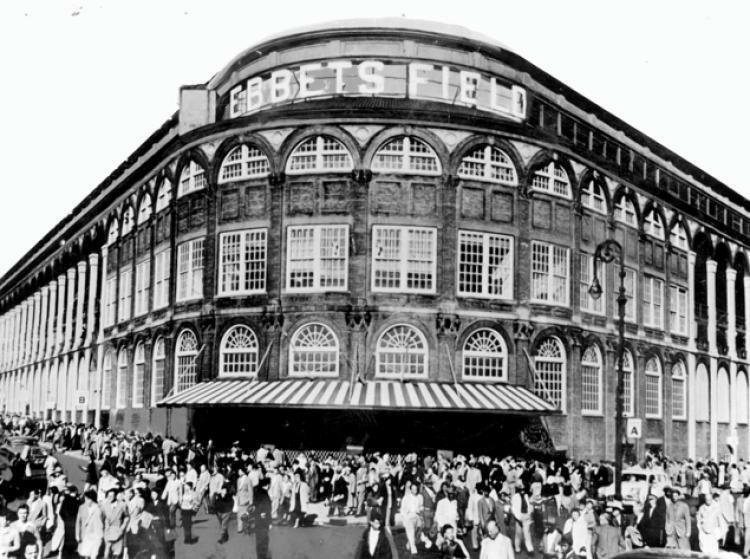 Ebbets Field, home of the Brooklyn Dodgers from 1913 through 1957. The Mets have won two World Championships and the Astros none since inception, but, at least in the Giants’ case, until recently the results between established franchise and expansion franchise were about the same. The Dodgers have won five titles since moving West, but none since 1988, while the Giants have won three, but didn’t get their first until 2010. West Coast baseball fans would have been grateful for any big league club in 1958, although in fairness they had enjoyed high-caliber minor league ball through the Pacific Coast League for many decades. In other words, it didn’t have to play out like it did. Sports and entertainment probably play a larger role in American society than they should. But for many, the diversion of sports can, on occasion, give families a shared interest, bring cities together and provide a common cultural bond. It wasn’t for nothing that Japanese soldiers used the insult “To hell with Babe Ruth” when attacking US troops during World War II. The loss of the two clubs left a void in New York, particularly Brooklyn, that has never fully been filled. The names of O’Malley and then-Giants owner Horace Stoneham still conjure less-than fond memories among old-time New Yorkers, particularly since both seemed opportunistic and unscrupulous schemers who sold out their city and left fans, at least initially, with only the New York Yankees. The National League again has demonstrated that it is a progressive organization. The transfer of the Giants and Dodgers means that two more great American municipalities are to have major league baseball without deny another city of the privilege. The National League, and I personally, will miss New York. But it is only human nature to want to reach new horizons. Today, the Dodgers continue to play in one of baseball’s best parks, Dodger Stadium, while the Giants, after finally discarding the dismal confines of Candlestick Park, now call inviting AT&T Park home. Except for a few retired numbers – such as those of former Giants Christy Mathewson, John McGraw, Bill Terry, Mel Ott, Carl Hubbell and Monte Irvin, and ex-Dodgers Reese, Campanella, Snider and Robinson – there are few reminders of New York within either organization. The current iteration of Salem Black River Presbyterian Church, a looming Greek Revival structure which shows surprising little wear and tear, dates to 1846. The church, Basilican in plan, with walls and ceilings of plaster and heart pine floors, has a slave gallery and boxed pews. It has played an important role in the development of the surrounding area, including the town of Mayesville, which today has approximately 700 residents, essentially unchanged over the past 125 years. The congregation dates to 1759, with congregants first worshiping in a log cabin, then moving to a framed structure shortly before the American Revolution. A third church was built in 1804 and used until the current building was erected. Its full-time first pastor, from 1773 until 1792, was Thomas Reese, a Princeton-educated churchman whose doctoral thesis was titled “The influence of Religion on Civic Society,” likely an unusual topic for an 18th century Colonial American theologian. The makeup of the church’s antebellum congregation reflected the rural region’s growing dependence on cotton and the need for slaves to sow, tend and reap that crop. In 1804 the congregation totaled 89: 45 whites and 44 blacks. In 1840, that number was 160, with 42 whites and 118 blacks. By the beginning of the War Between the States, the church’s rolls showed 67 white members and 389 blacks. Many of the black congregants, who no doubt attended the church because they were required to, left Salem Church shortly after the war’s end to join Goodwill Presbyterian Church, just down the road from Salem Church. Goodwill Presbyterian Church, just down the road from Salem Church, was begun in 1867 by black members of Salem Church. 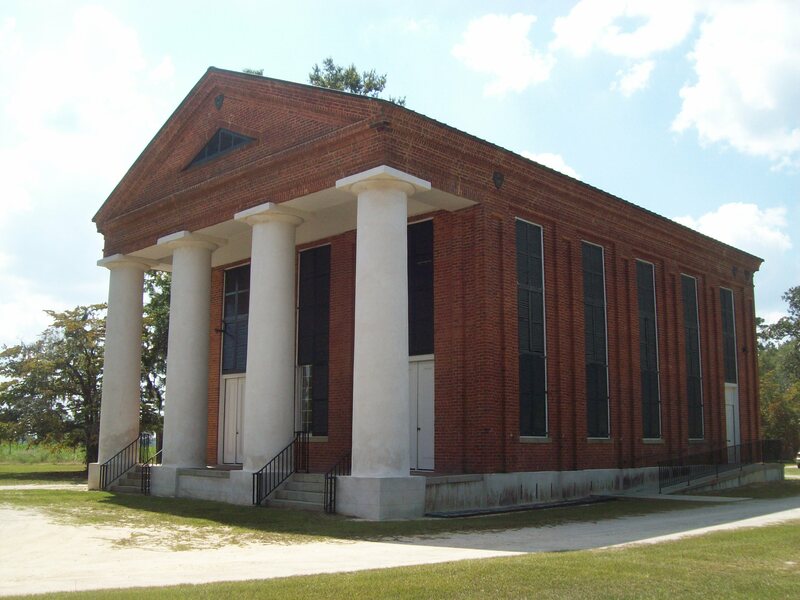 Goodwill Presbyterian went on to become the mother church to many African-American churches in South Carolina, according to the blog Everything Happens at the Crossroads, which recounts a history of the Mayesville area. Today, Salem Church has just 30 members of its roles and averages active attendance of 14 for its services, according to a 2015 article in the Darlington News and Press. Among noted members of Salem Church have been Robert Witherspoon, a US Congressman who served during James Madison’s first term; Matthew Peterson Mayes, who served in the SC legislature and signed the SC Ordinance of Secession; and James M. Dabbs Sr., who, despite being born in 1896 and growing up on 10,000-acre plantation, was a Civil Rights leader who also served as a professor, farmer, author, church leader and Penn School Community Services trustee. Dabbs deserve special attention. He took up the civil rights cause in the mid-1940s when he began writing about segregation and racial injustice in Southern culture. Dabbs served as president of the Southern Regional Council from 1957 until 1963, during which time he endorsed a petition requesting executive clemency from President John F. Kennedy for imprisoned civil rights activist Carl Braden. His wife Edith Mitchell Dabbs was also active in the Civil Rights movement. Salem Church, despite the declining health of the surrounding area and the size of its congregation, continues to hold services twice a month, and both the church and graveyard are kept in immaculate condition. After more than 150 years, the identity of an Alabama soldier who died in the waning days of the War Between the States has been uncovered. The late Edith Greisser of the Newberry Historical and Museum Society spent many hours tracking down information about the 14 Confederate soldiers who had died while passing through Newberry on their way home in 1865 and were buried in the Old Newberry Village Cemetery. Five have never been identified, but Brown was the only one with a partial identity. Greisser, who died in 2013, tried the Alabama State Archives and found there were more than 400 Confederate soldiers with the surname Brown. However, there were only three “Lieutenant Browns”; an A.J. Brown, an F.A. Brown and a J.M. Brown. Curiously, all were members of the 5th Alabama Infantry Regiment, though of different companies. Veterans Administration gravestone for Josiah M. Brown, issued before his full identity was known. Greisser contacted the Chamber of Commerce in Greene County, and a representative went to the Confederate monument in town, but the only Brown listed was one who had died after 1907. Chapters of Sons of Confederate Veterans, the United Daughters of the Confederacy and the Freemasons were no longer active in the county, a reflection of the hard times that have fallen on the area in the decades since the war’s end. Greene County, located in the western half of the state, is the least populated county in Alabama, with fewer than 9,000 residents. By comparison, it had more than 30,000 residents in 1860. Its population fell by more than 40 percent between the 1860 and 1870 censuses, reflecting the heavy toll the war took on its populace. A Masonic funeral service was conducted for Brown, at his request, but the Masonic records of the Newberry lodge were lost in a fire in 1866. The South Carolina State Masonic Lodge did not have the duplicate record of 1865 for Newberry Lodge in its collection. Members of the Amity Lodge in Newberry recently picked up the ball and got in contact with the Alabama State Masonic Lodge. 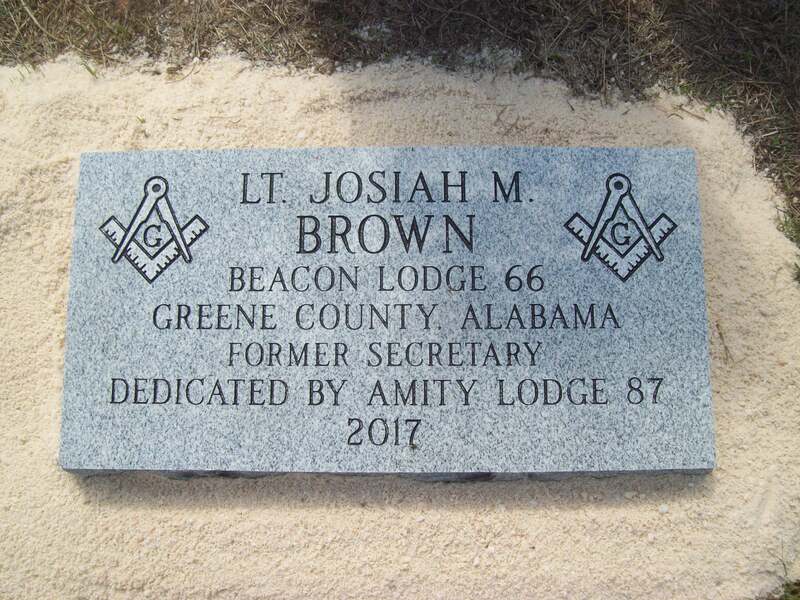 Gene Wicker, a member of the Amity Lodge, was able to discover that a Josiah M. Brown, who had served as an officer in Company D of the 5th Alabama, had been a member of the Beacon Lodge in Greene County, Ala., joining before the war, thereby solving the mystery. The 5th Alabama saw its share of severe action, fighting at Seven Pines, Gaines’ Mill, Malvern Hill, Second Manassas, Boonsboro, Antietam, Chancellorsville, Gettysburg, the Wilderness, Spottsylvania, Cold Harbor, and around Petersburg in the last months of the war. Brown was wounded at least once, at Gettysburg. This past Sunday, a granite stone identifying Josiah M. Brown by his full name was unveiled at the Old Newberry County Cemetery, next to a Veterans Administration marker that reads “Lieut. 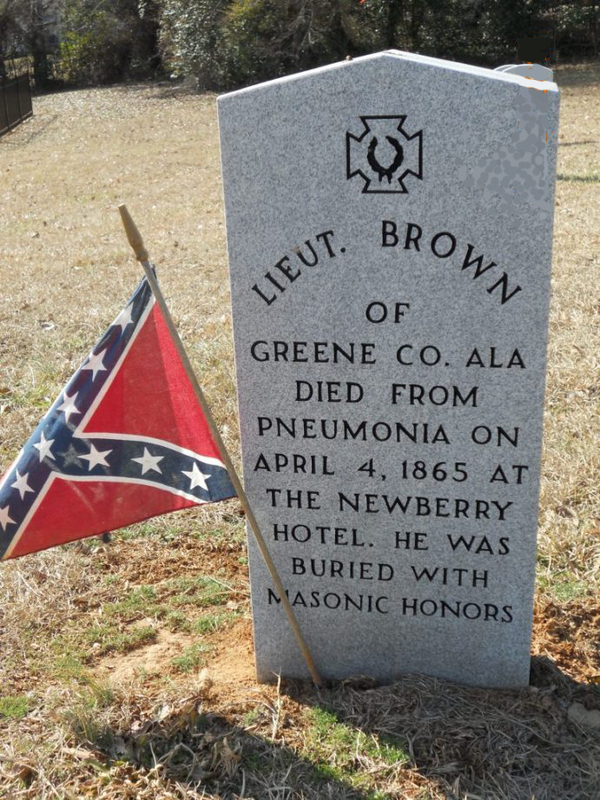 Brown of Greene Co. Ala.” It was paid for by Amity Lodge member Huger Caughman Sr.
“As Masons, we take a vow to take care of our brothers, and that vow extends to the grave,” said Jason Moore, the Worshipful Master of the Amity Lodge, during a brief ceremony. The recent hurricane that devastated the Caribbean and Florida was no laughing matter. 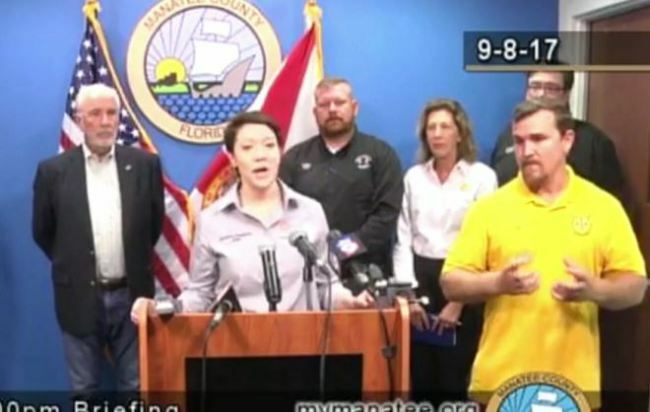 But officials in Manatee County, Fla., unwittingly added hilarity to a Sept. 8 press conference when they hired a bumbling interpreter for the deaf for an emergency briefing related to Irma. The interpreter, Marshall Greene, a lifeguard for the county, has a brother who is deaf, according to the DailyMoth, a video news site that provides information via American Sign Language. Greene mostly signed gibbering, referencing pizza, monsters and using the phrase “help you at that time to use bear big,” during the event. Other information signed to viewers was incomplete, members of the deaf community said. While there’s no question that the county failed in its responsibility to the hearing impaired, watching a video of the press conference, with Greene’s signing translated into subtitles, is amusing to say the least. You can watch one of the videos here. The county typically uses interpreters from VisCom, a professional sign language interpreting service. VisCom owner Charlene McCarthy told local media she was not contacted about providing services for the press conference and that Green was apparently not fluent in American Sign Language, according to the website AL.com. Manatee County spokesperson Nick Azzara told the Bradenton Herald Greene was asked to interpret during the storm rather than have no one signing. In retrospect, one suspects county officials now understand that it would have been better to have no one signing rather than an individual informing the deaf about pizza and monsters while a major storm worked its way toward them.